PMS, menopause and breast cancer would be called "co-morbidities". Neuroanatomical differences between men and women would be cited as evidence of pathology. Low employment wages and education rates (which would be worse than in our reality) would be cited as evidence of poor long-term outcome. Some researchers would speculate that differences in hair and blood mineral concentrations between men and women might give clues on the etiology of femaleness, and could even lead to a cure. Twin studies would find a very high concordance of femaleness among monozygotic twins (near 100%) and not so high among dizygotic twins (around 50%). Researchers would thus conclude that a single gene must be involved in the etiology of femaleness. Giving birth would be considered a "splinter skill". Instead of gynecologists, there would be DFN! doctors. Some ethically-challenged doctors would recommend hormone agonists to try to cure femaleness, and some parents would go along with such recommendations despite well known adverse effects. Parents would lament that their female children will never become engineers or athletes. Whenever females do become engineers or athletes, people would wonder if that means they are men now. Some parents would declare their female children "recovered" after they start playing with toy cars. People would speculate that, curiously, women appear to be more attractive than men. Men would tell of horror stories of women who became hysterical and "had to" be drugged/committed. Thomas Szasz would claim that "female" does not exist, but is simply an expedient label given to those without penises so they can be marginalized. Others would argue endlessly over whether femaleness is a disease, a disability, or simply a difference. Some would also argue that person-first language ("she has femaleness") is more value-free than person-second language ("she is female"). Claims that gender roles are a cultural construct or that "female" is a type of person would be scoffed at. Feminists would be called anti-cure advocates. The feminist movement would be dismissed as being comprised mostly of mildly feminine females, and a few mildly masculine males. Females with an anti-cure view would be asked for proof of gender, including pictures of genitalia. Females with a pro-cure view would not. There would be a blog titled "Hating Femaleness" by someone who, not surprisingly, also hates homosexuality. Whenever they come across a medicalized article about them, females would feel like crap. Zilari has posted a follow-up titled A Better World? An argument that has come up often as of late is an appeal to acknowledgment of anecdote: "You refuse to look at all the cured kids." Let me be clear that I'd be happy to read any case reports of autistic kids who have been deemed recovered. Unfortunately, I have not been able to find such reports, particularly as they relate to biomedical interventions. The reports that do exist relate either to behavioral interventions or to no specified intervention. It is important to acknowledge that loss of label does happen in autism, although not very frequently. For example, Szatmari et al. (1989) found that 25% of "nonretarded autistic children" had a very good long-term outcome and could be considered recovered. Note that the study was published in 1989, before ABA was available, and before any of the modern biomedical interventions became popular. Note also that in California, about 60% of all autistics (of all ages) registered with CDDS are "nonretarded". (Clients of CDDS classified as having autism are not supposed to be PDD-NOS or Asperger, but maybe some are). Therefore, we should expect that at least 15% of all California autistic children currently in the system will eventually be considered recovered. That's a lot of children. And certainly these days most of them will have undergone some kind of intervention. It is not surprising then to hear of many anecdotes of children who have recovered thanks to some intervention. My favorite case in point is Secretin. There was a Dateline show back in 1998 that told the story of Parker Beck, who was believed to have improved substantially after receiving a small amount of Secretin. I will quote a passage from the segment. "In my book, Victoria Beck is a veritable hero," says Dr. Woody McGinnis, a general practitioner from Phoenix, Arizona. He was one of the first doctors to take Victoria and her discovery seriously. He now specializes in treating autistic children. He says that in his medical opinion, it's possible that a mother in New Hampshire has discovered a miracle treatment, maybe even a cure. Dr. Bernard Rimland was one of the most enthusiastic promoters of Secretin as an autism treatment. I will quote him below. So what happened to Secretin? Many double-blind studies were done, as they should, and they consistently found no benefit from Secretin compared to placebo. In fact, some studies appeared to show a non-significant negative effect. The studies also documented for the first time how strong placebo effects are in autism. While some biomed researchers such as Bradstreet (and perhaps Dr. Rimland himself) still believe it is useful as an autism treatment, Secretin has fallen out of favor almost completely. Research should go on, of course. But I suggest expectations should be managed, and claims of recovery rates should only be made after the double-blind placebo-controlled studies (preferably with independent replications) come back with results. As George Santayana says, "Those who cannot learn from history are doomed to repeat it." CDDS Q2 2006: What Will David Kirby Do? If the total number of 3-5 year olds in the California DDS system has not declined by 2007, that would deal a severe blow to the autism-thimerosal hypothesis. Note that what David Kirby is expecting to see is a drop in the total number of 3-5 year olds. He might now claim that gradual drops in caseload growth are significant (without explaining why) but clearly that's not what he agreed to. Let's see what the California DDS Quarterly Client Characteristics Report says, with only two quarters to go before 2007. Table 1: State-wide comparison of Q2 2006 with two prior quarters. The key information in Table 1 is that the 3-5 caseload continues to grow, and this growth is still rather fast (11.70% annually). Barring any miracles, in two quarters David Kirby will either need to issue a statement saying that he no longer believes in the autism-thimerosal hypothesis, further goalpost-shift the target date for a caseload drop, or claim that there hasn't really been a significant drop in the thimerosal dose per child in California. What do readers predict he will do? 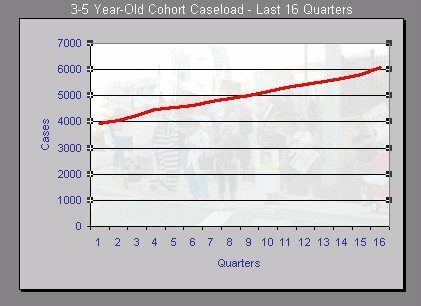 It's surprising that caseload growth has increased for the second or third consecutive quarter. The prior tendency was for caseload growth to drop gradually, which should be expected, as I've argued repeatedly. It would seem that it will be a while before annual caseload growth goes down to population growth in the state, about 1.3%. I can only speculate about the implications of this turn of events, but for the time being I'm having doubts that prevalence will level off in 10 years, as I had previously estimated. Dad of Cameron has sent me the following graph of the 3-5 caseload for the last 16 quarters. I noted that this line is not showing any signs of leveling off. Annual growth has remained consistently over 10%. To contrast, imagine what the line should look like if it had leveled off. At 1.3% annual growth, in 4 years it should have gone from about 4,000 to about 4,212 (i.e. nearly horizontal). Prenatal genetic testing is not about reproductive choice. It's about eugenics. It presumes that certain kinds of people should not be allowed to exist, for their own good. Nonsensical and misguided as eugenics is, most people won't really notice that it's being carried out unless they believe it might have consequences beyond the obvious. We need to educate the public on why eugenics is wrong, why it can't work, and why it ultimately is a bad choice for society as a whole. Please join the protest if you haven't yet. Joseph. The Pragmatic Case Against Eugenics. Julia. We Were Not Always Thus. AFF. Apology From An Autism Researcher. Abfh. Next Fight, Or Last Day. Prometheus. An Embarrassment of Riches. Nathan. 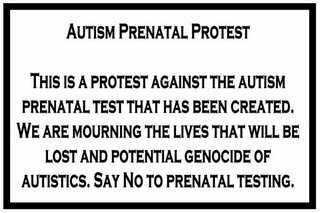 Autism Prenatal Testing (Interview with Bonnie Ventura). Abfh. On Culture and Diversity. Caplan, Arthur (MSNBC). Would You Have Allowed Bill Gates To Be Born? Shh...Mum is Thinking. 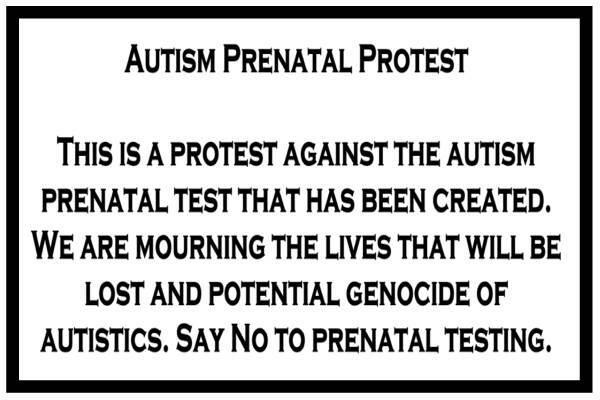 Protest Against Prenatal Testing. Kassiane. Where Is The Line Drawn? Dinah Murray. Discussion paper on eugenics and diversity. A couple of studies have been published claiming to document a correlation between autism and environmental pollutants. It is not surprising that such studies would come out as the thimerosal hypothesis of autism is phased out. It is also not surprising considering that it is now well known that the "epidemic" of autism was geographically isolated for the most part. Palmer et al. (2006) did a correlation analysis in Texas, focusing on mercury emissions. Windham et al. (2006) is a more methodologically sound study, not married to mercury, that looked at the relation between autism and "hazardous air pollutants" (HAPs) in the San Francisco Bay Area, California. Mercury deposits in the western U.S. (including Texas) come mainly from Asia. Texas emissions are deposited in the eastern U.S. The primary source of mercury exposure in humans is fish, and fish are also exposed to mercury elsewhere. Autism incidence was already known to be linked to degree of urbanization. A correlation with many factors, including other chemicals, is thus expected. The response by Palmer et al. to Lewandowski was unsatisfactory and essentially conceded that the correlation was inconclusive and should be studied further. Another point is that a major source of environmental mercury exposure is coal burning, which is not as much an issue as it used to be. The rough link to degree of urbanization needs to be emphasized. Because of this link, if a researcher were to look for a correlation between, say, consumption of French fries and the administrative incidence of autism, they could very well find a correlation, giving credence to the autism fries hypothesis. So it's not sufficient to document these types of correlations. Windham et al. admit that there could be "uncontrolled confounding" in their study. This confounding may or may not be environmental in nature. The California Department of Developmental Services (CDDS) provides sufficient information to determine if regional differences in autism prevalence are real. I will try to use this data to show that one should be skeptical of the correlations found by Windham et al. and any correlations where degree of urbanization acts as a proxy. I will use data provided to me by CDDS. Readers can obtain this data by emailing datax at dds.ca.gov and asking for the file named CDER Qrt Data.XLS with autistic client characteristics for each regional center (or post your email address in the comments section). Readers may also find the regional center map useful to follow the analysis. In order to make a valid claim that there is correlation between autism and something else, a researcher should make sure they are comparing apples with apples. If what "autism" is in one region differs from what "autism" is in another region, then the correlation analysis has no merit. One way to tell if "autism" is equivalent across regions is to compare the characteristics of those diagnosed with autism. Table 1 lists autistic client characteristics in regional centers across the Bay Area. The autism-epilepsy ratio turns out to be a good indicator of prevalence for a region. (This could also be autism-cerebral palsy ratio, or the reader could determine the total population served by a regional center if so inclined). The last column of Table 1 represents the recognition of autism in the population with mental retardation. I have found that differences in this rate of recognition throw off the other proportions. So in this case we're fortunate that differences in this proportion in Table 1 are small. Table 1 shows that there is inequivalence between regional centers. But it is also of interest that in regional centers with higher autism prevalence, the proportion of autistic clients with mental retardation, epilepsy and severe behaviors is lower. A more dramatic example of this phenomenon can be observed in Table 2. We can see that North LA has an autism prevalence about 2.4 times that of San Diego, but proportionally, about 2.4 times as many autistics have mental retardation in San Diego as they do in North LA. (I chose these two regional centers because, again, their recognition of autism in the mental retardation population is similar, which allows for a fair comparison). Presumably, something unusual happened in the 1990s in LA that did not happen nearly as much elsewhere, e.g. there was a significant upsurge of environmental pollution. Whatever it was, it's apparently leveling off now. 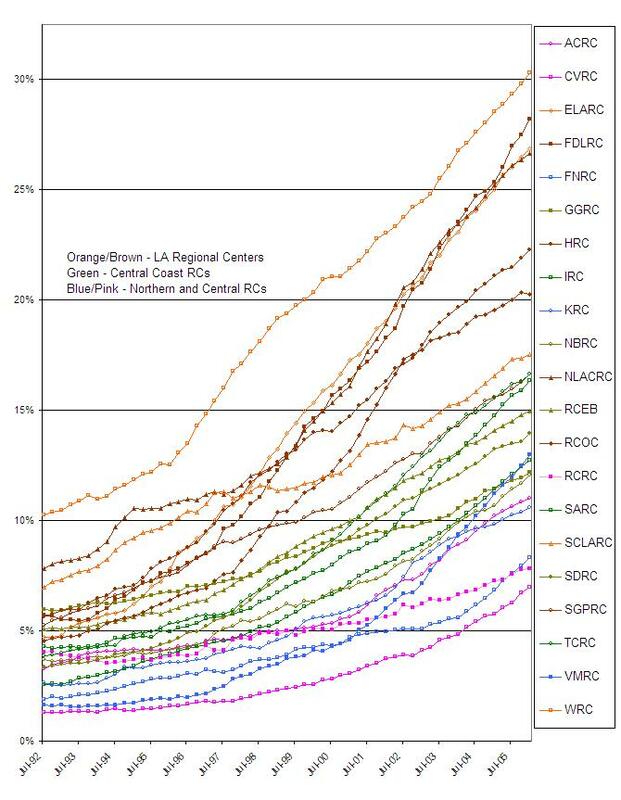 What's strange is that the regional center with the lowest prevalence of autism in the state, Central Valley, currently has an annual autism caseload growth of 23.94%, whereas the regional center with highest prevalence in the state, Westside, has an annual autism caseload growth of 8.7%. (Note that annual caseload growth is 10.5% for the state as a whole). One would have to assume that there has been a very significant shift in emissions of environmental pollution, with Central Valley all of the sudden surpassing Westside in emissions and growing much faster. It is far more likely that Central Valley was behind in its recognition of autism and is now simply catching up. Why Only the Bay Area? It is unfortunate that Windham et al. decided to only look at the Bay Area. It would have been interesting to see their take on why the prevalence of autism in the Far Northern regional center (apparently a very sparsely populated area) is about 1.7 times that of the Central Valley regional center (which has a city, Fresno, population 400,000). Or why the prevalence of autism in East LA is slightly lower than that of Westside. 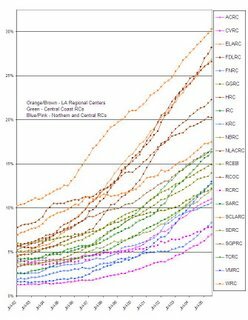 Or why the South Central regional center has a considerably lower prevalence than all of the surrounding regional centers in the LA area. Before we can move forward with regional prevalence differences and whether they correlate to various environmental triggers, it is necessary to determine that these differences exist in reality. Recognition of autism in the population with mental retardation is the key variable, because once this proportion is adjusted, it appears that the rest of the variation can be explained through differences in the definition of "autism". So I would recommend carrying out the following pilot study. Random groups of clients with mental retardation from Central Valley and Westside should be selected (at least 100 each). An evaluator blind to region and to pre-existing diagnoses would evaluate the clients for DSM-IV autism. This would tell us if it is true that Westside has significantly more autism than Central Valley in reality.